Vladimir Putin, in search of new friends these days, would do well to call Narendra Modi to talk about the promotion of the unique bilateral relationship. India’s prime minister-designate Narendra Modi has jumped into the twitter universe with as much enthusiasm and determination as those he displayed as the Bharatiya Janata Party’s prime ministerial candidate in the general elections that concluded barely a fortnight ago. Of the 5149 tweets on his page, two were prominently delivered to Moscow, Russia, including one to the Kremlin. If we weren’t so sure before, well now we do. Social media will continue to play a big role in the new PM’s communication outreach, considering its increasing importance on the world stage. 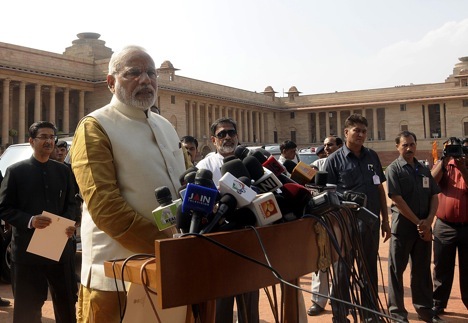 Narendra Modi is nothing if not closely attuned to the march of technology. Certainly, Russia will be on top of the list of nations that Modi will look forward to doing business with. Japan, Germany and the US are on that list too, with the relationship with Japanese Prime Minister Shinzo Abe far and away the most comfortable and intense of the lot. Modi called back German Chancellor Angela Merkel for her good wishes, indicating that Berlin’s investment in New Delhi has been worth it. As for the US, Modi will also make an effort to normalise the personal humiliation heaped upon him for the last nine years since he was denied a visa by the US State Department. There were other calls and messages too, to countries as varied as New Zealand and Israel and Fiji and Spain. Interestingly, China was conspicuous by its absence on Modi’s twitterpage. The moral of the story? Russian President Vladimir Putin, in search of new friends these days, would do well to call Narendra Modi to talk about the promotion of the unique India-Russia relationship. Modi’s elevation to the top job in Delhi is a huge opportunity for Moscow to expand its ambit of very special relationships. Putin will find that Modi in more than a reciprocal mood. Both countries have recently signed an atomic energy agreement – in complete secret, I may add – to build two more civilian nuclear power plants at Kudankulam. Two are already being built on that site and now there is an agreement to build two more. The original Kudankulam agreement was signed as long back as 1989 between erstwhile leaders Rajiv Gandhi and Mikhail Gorbachev. The world has, since, been totally overhauled – Russia is a new country and India bears little resemblance to what it once was. Rajiv’s widow, Sonia Gandhi, has been smarted and bested in these elections by Modi. But some things clearly remain the same. The Indo-Russian relationship seems to be one of them. The trouble with the relationship, notwithstanding the lease of a Russian nuclear submarine to India, Moscow’s participation in the BrahMos missile project and other worthy defence programmes, is that the people-to-people component is lacking. Jawaharlal Nehru and Indira Gandhi’s soft focus has faded away and nothing was able to replace it these past few decades – not even Manmohan Singh’s well-meaning but brief comments. Enter Narendra Modi. He may not ride a horse like Putin does, but Putin will see that he is able to match him on several other counts. Both are larger-than-life personalities and both need help to walk the talk. If Modi can get a bit of the gas that Gazprom so desperately wants to sell China, thereby easing the immense energy pressures on India, see how quickly Modi is on that next code-shared Air India-Aeroflot flight to Moscow. Still, no one in Moscow or Delhi should make the mistake of thinking that Modi’s personal bad blood with the US will come in the way of enhancing India’s all-important relationship with America. Modi is too sharp for that; he understands the need for investment and strategy all too well. Few could have fought the bruising election in India’s northern state of Uttar Pradesh and won 71 seats out of 80 – a victory that has catapulted him straight onto the throne of Delhi. Modi will reach out to America – but from a position of strength. There will be none of the “India loves you” commentary that Manmohan Singh once so embarrassingly uttered to George Bush. The time is now for a new page in the India-Russia relationship. Jyoti Malhotra is a political and foreign affairs analyst based in New Delhi, India. Her Twitter handle is @jomalhotra.